The Balearic Islands (Catalan and official: Illes Balears; Spanish: Islas Baleares) are an archipelago in the Mediterranean Sea, located off the coast of Spain. They are a province and autonomous community of Spain. 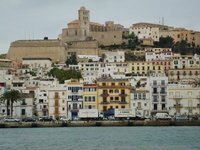 The most famous island is Ibiza, which has a very active nightlife. The other two main islands are Mallorca and Menorca, the latter being the most quiet. The least known of the main islands is however Formentera. Palma de Mallorca Airport (IATA: PMI, ICAO: LEPA), located 15 minutes' drive from the city, is the main airport in Mallorca. After Madrid Barajas Airport and Barcelona Airport this is the third busiest airport in the country and one of the busiest during summer. Numerous airlines serve the island, including several budget airlines like Easyjet and Ryanair. Dozens of cities have connections, mainly in the north and west of Europe, as well as places closer by in the south. Ryanair has flights to Alicante, Birmingham, Bournemouth, Bremen, Dublin, Edinburgh, ]]Frankfurt|Frankfurt-Hahn]], Girona, Glasgow-Prestwick, Leeds/Bradford, Liverpool, London-Stansted, Lübeck, Madrid, Reus (near Barcelona, Shannon, Stockholm-Skavsta and Weeze (near Düsseldorf). Air Berlin is another big one serving the island with destinations like Almería, Amsterdam, Asturias, Barcelona, Basel/Mulhouse, Berlin, Bilbao, Bremen, Ciudad Real, Cologne/Bonn, Copenhagen, Dortmund, Dresden, Düsseldorf, Erfurt, Faro, Frankfurt, Hamburg, Hannover, Ibiza, Jerez de la Frontera, Karlsruhe, Leipzig, Lisbon, Madrid, Málaga, Menorca, Munich, Murcia, Nuremberg, Porto, Santiago de Compostela, Seville, Stuttgart, Valencia andZürich. Thomson Airways, Thomas Cook Airlines, TUIfly, Easyjet and Condor air other big airlines, mainly serving the UK, Germany and Spain but some other destinations as well. Ibiza and Menorca have less flights though there are still quite a few cities from where you can fly, mostly in Spain but also the bigger cities in the rest of Europe. Several ferry operators have connections to Mallorca from mainland Spain. Acciona Trasmediterránea has boats to and from Alicante for example. Other ferry operators include Balearia between Barcelona, Valencia and Denia and Mallorca. Iscomar offers roughly the same connections as well. Trasmediterranea between Marseille and Palma de Mallorca. Palma de Mallorca Airport (IATA: PMI, ICAO: LEPA), located 15 minutes' drive from the city, is the main airport in Mallorca. One can also drive from the airport to other parts of Mallorca within an hour. For an overview of schedules and connections, check thebusschedule.com. Acciona Trasmediterránea, Balearia and Iscomar offers ferries connections between the Balearic Islands. This is version 29. Last edited at 8:16 on Jul 25, 14 by Utrecht. 15 articles link to this page.